Bramley Moriah Primitive Methodist chapel was one of three Methodist chapels within a stone’s throw of each other in the centre of Town Street, the others being Wesley Place and Brunswick. In 1956 these three congregations came together under the one roof to form the current Trinity Methodist society. Moriah and its Sunday School building was sited up a narrow alley called The Crescent, which lay off Upper Town Street, just to the west of Wesley Terrace. It is approximately where Wesley Close is. West Yorkshire Archive Service, Leeds holds records between 1869-1956. The Primitive Methodist magazine for 1835 contains an account by W Taylor of the opening of an earlier Primitive Methodist chapel in Bramley. The opening services on January 25th and 29th 1835 were addressed by Rev Ely (Independent minister) and Messrs Barker, King, Sanderson & Watson. The 1835 chapel was large, seating 500 and with a “commodious” room under the chapel for Sunday school. The first chapel was opened on Friday, 23 January 1835 and school premises were opened in August 1866 having since 1859 met in a cottage. 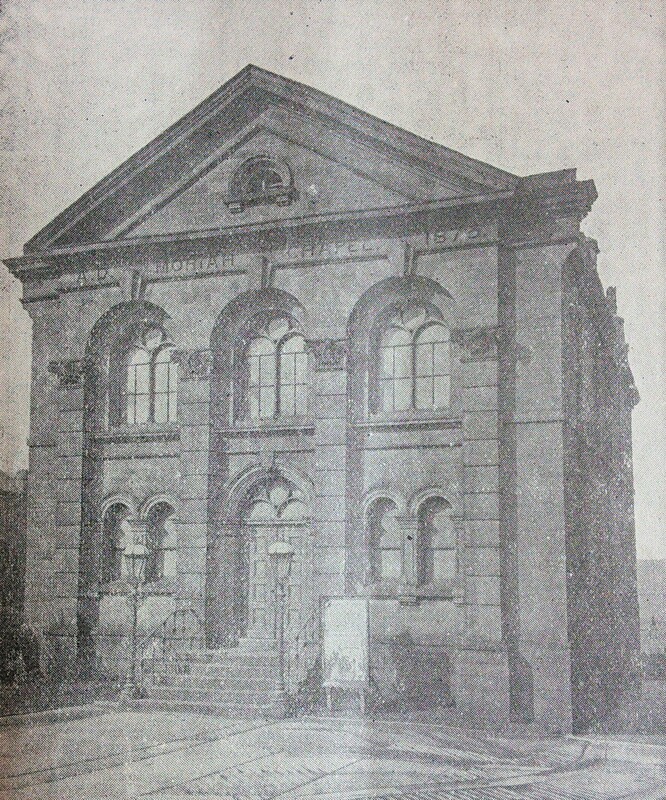 All was replaced by the building illustrated, opened on 26 August 1874, architect Joseph Wright. Does anyone know where this earlier chapel in Bramley was and what happened to it?